Painting, which many consider as a hobby, need not be a past time activity only. Unlike in the past, the modern times offer innumerable opportunities for an artist to make a successful career out of his passion. However, no career can take off without proper planning and timely guidance. Hence, it is essential to understand the challenges and opportunities offered by the various choices before you. Before we delve into the details, let us understand who is a painter and how can he/she be a professional. Painter is a generic term used to address the artists who commission their paintings to private or corporate collectors, displays their works in museums or art galleries, or are hired for various artistic works like painting a portrait or landscape. They work in their own studios or for established art houses or even artist collectives. They can be seen in various establishments like media, educational institutions, art galleries and the like. • Art Therapist – An art therapist uses the creative process of art for the physical, mental and emotional betterment of individuals. It is considered an effective method of resolving conflicts and stress, by boosting self-awareness and self-esteem. • Arts Administrator – A career in managing art programs in education, therapy, or public service waits an arts administrator. Overall supervision, applying for grants, reporting to the donors and governing bodies of the organisation, and planning for the organisation are some of the tasks included. • Art Restoration Specialist – A specialist will be entrusted with the cleaning, repairing, and restoring a damaged work of art to a condition similar to its original state. He/she would have to work with rare and valuable works of art regularly. • Visiting Artist – This gives you the option of mixing your studio time with teaching. The resources of the host organisation can be used to fine-tune your skills. • Commercial Artist – Such an artist is involved in the process of producing art for promotional materials and commercials. • Muralist – A muralist would work on extremely large works of art, which is applied to a wall, ceiling or floor. Different styles are used to enhance the beauty of the settings by mural artworks. • Art Director – This again is a highly rewarding job, which requires a lot of creativity and artistic instincts. An art director will be engaged in the designing and direction of images in publications, product packaging, and feature film productions. • Graphic Designer – One of the most sought after careers in art is that of a graphic designer. He creates visuals for promotions and advertising using computer software or by hand. Designing book covers, magazine covers and other publications also come under the purview of the graphic designer. Although many art schools and institutions, including colleges and universities offer various courses in painting and fine art, the basic requirement is an ability to portray ideas in the form of drawings and paintings. The courses offered can help you to hone your skills by providing specific inputs and techniques. 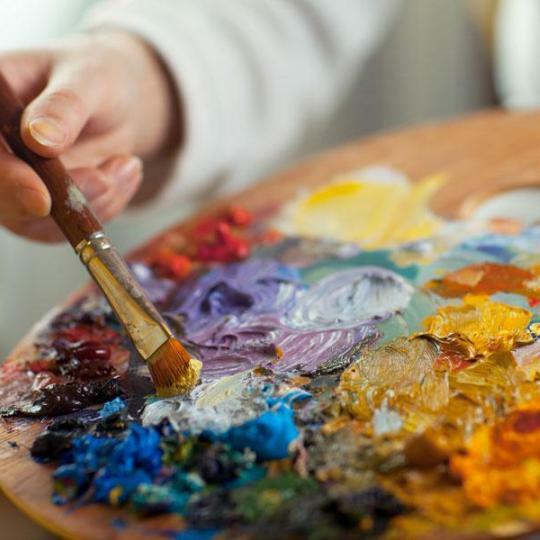 There are several associates, bachelors, and master’s degree programs in painting and fine art, which focuses on the development of painting skills, while giving offering more insights into the history, theory, and criticism of art. In short, Painting as a career is a very good option if you are artistically inclined and want to make use of your talent to earn a living.